I made myself a Scrunchable Scarf, and decided I needed a hat. So I made one. 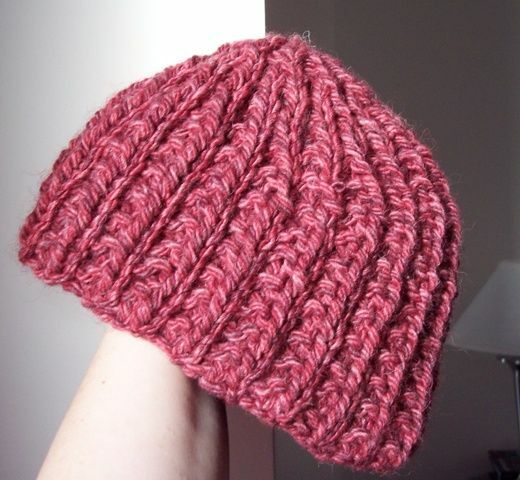 It incorporates the same lovely squishy stitch, and some short rows. Knit a gauge swatch of the K1, P2 stitch pattern (or use your scarf as a swatch), and note how many stitches per inch you use. Measure your head from forehead to base of head at the back and then subtract 1-2″ for negative ease, pending on how snug you like your cloche. Multiply your SPI and your head measurement (minus the ease), and round up to the nearest multiple of 3. This is your Cast On number. CO in multiples of 3, join to knit in the round, being careful not to twist. Mark your beginning of row, and the next multiple of three above your half way mark. eg: mine was 34.5 so I set the ‘half’ mark at 39. Repeat rows 1 & 2 until you have 12 rows. Knit in pattern to 3 stitches before the last wrapped stitch, wrap next stitch and turn work. Continue until you have short rowwed 10 times (5 on RS, 5 on WS) and then Knit one round in K2P1 pattern, and one round in K1P2 pattern. Pull end through live stitches and gather for the top. A fresh start and a Dragon! Thank you for not only thinking this out but putting where others could find it. My daughter is an urban pedestrian…..and I wanted a hat she could take off and scrunch into a pocket….and I think this will do fine!